Let me start by saying that I have mad respect for public speakers. It takes a great deal of time, thought, composure, and courage to share your ideas and perspectives with audiences both large and small. It is no easy feat to step up and out into this arena, which is probably why public speaking is high on the list of our “greatest fears.” It’s one of those occurrences where we are typically happier on the receiving end and offer pity to the “poor soul” up front with a microphone. Often times though, it’s equally uncomfortable for both parties…and yet this is exactly where many of us will find ourselves this graduation season. The whole idea causes my mind to take a stroll down memory lane. First, as a sixth grader giving a pseudo-valedictorian speech to my classmates as we prepared to advance to junior high. I can remember pouring my thoughts onto a few sheets of wide-rule notebook paper…the usual platitudes intermixed with memories of sixth grade antics. I can recall wearing my hair up (an attempt to look more sophisticated, I’m sure,) donning a flowery dress and trying very hard to speak slowly and clearly. My palms were sweaty and I hardly recognized my own voice over the loud-speaker. The event venue, a school gymnasium, seemed extra cavernous and despite the dozens of parents and family members in the audience…there were moments where I felt like I was all alone. Time passed so slowly…each second its own eternity. The whole speech couldn’t have been more than seven or eight minutes and while it concluded with applause, I always wondered if maybe they were just happy that it was done? I know I was. Twenty plus years later, I can still see the faces of those who spoke at my high school graduation ceremony, but what they said is a complete blur. Classmates, community leaders, administrators…their mouths were moving, but I have no idea what they spoke of that day. What I can clearly remember are my sunglasses: mirrored wannabe wayfarers. 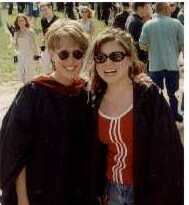 We wore our graduation caps toward the back of our heads to accommodate our extra-large mall bangs and adding sunglasses (and not disturbing the bobby pins) was not easy. It was an extraordinary, bright, sunshiny day (I remember that)…and I NEEDED those sunglasses. Gathering in a long line, I remember looking at the faces all around me and realizing I didn’t know everyone’s names (a sad fact that weighs on my heart today.) Obviously, it was loud as we paraded onto the football field with music and cheering family and friends in the background, but as soon as the ceremony began I was lost in my own thoughts. Deliberately taking in the moment, I was convinced that I would never experience anything like this again. I looked for my family in the stands. I smiled at my best friends. I scoped out a cute boy. I looked at the sky…a lot. This day could never be duplicated and in some ways both the world and time stood still. There was a charge in the atmosphere (one that would eventually lead to a thunderstorm and tornado warning that night.) And while the message was lost on me, I silently prayed that the valedictorian would just keep talking. That didn’t happen. And in a blink of an eye, I found myself preparing for yet another graduation. The forecast called for yet another extraordinary, bright and sunshiny graduation day. (Newsflash: It’s also very humid in Lawrence, Kansas.) Thinking ahead, I decided to wear a red tank top and a pair of cut off jean shorts under my graduation gown. Not your typical graduation attire…oh well. I had a paper fish on the top of my cap (so that my grandmother could pick me out of the “sea of students” making their way down the hill.) I wore comfortable brown sandals as we walked in a procession according to major. (If I close my eyes, I’m practically there all over.) 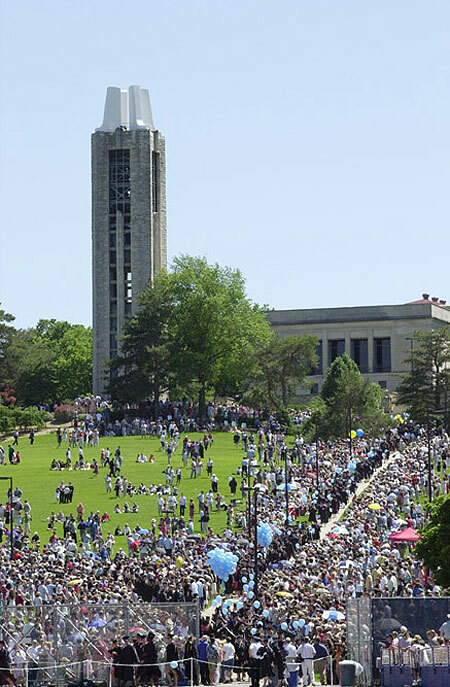 As you can imagine, a large university has an especially long ceremony. There were many, many speakers that day. We took our seats under the hot sun and fanned ourselves with the graduation handout. I remember thinking (again) that I would never experience anything like this. I looked for my family in the stands (futile with this many people around.) I smiled at my friends and remembered that the cute boy in my life at the time was sitting in the audience. And, of course, I couldn’t resist looking up at the sky. Everything moved in slow motion. The audience’s applause were my only signal that one speaker had finished and/or another speaker was being introduced. They just kept going…probably offering up similar platitudes to the speech I gave way back in sixth grade. “Reach for the stars, believe in yourself, this isn’t the end…it’s only the beginning,” at least that’s what I imagine they said. Honestly, though, I have no idea. Another motivational speech in one ear and out the other. But what I do know for sure is that the sky was the best shade of blue that day. The breeze was satisfying in a way that you can only appreciate when you’re wearing the color black in the heat. Joy and relief abounded in every direction. And while most of my classmates could hardly sit still, I remember thinking that I wanted to stay there forever. I regret that I didn’t take more pictures back then…although I am grateful that we didn’t have the distraction of smartphones. And just like that, it was over. The speeches stopped and real life began again…a new chapter. I threw my cap (paper fish and all) high into the afternoon sky and never bothered to retrieve it. I congratulated the eight-year old girl inside of me for accomplishing her goal of graduating college and securing her “dream” job. And just like in the movies, I had a hard time leaving that day. There were several glances back over my shoulder. Last looks. Fast forward all these years later and I now find myself attending these same type of events. I see students waiting (some anxiously, others joyfully,) parents reacting emotionally, spectators sitting impatiently, and speakers searching for new and interesting ways to connect with the audience…to say something worthwhile and meaningful. Maybe even something unforgettable. Having done some public speaking in my adult life, I feel a little guilty when someone approaches the podium. Guilty that I didn’t pay attention back then…knowing all too well how much work actually goes into preparing such a speech. Yet today I finally realize that maybe the graduation messages of my yesterdays were not actually lost on me. Perhaps, delivered in that moment was the exact message that I needed to hear after all. When the speaker took his/her place at the podium I was invited to sit, to pause, to reflect and to savor. It was an opportunity to take a deep breath and fully absorb the moment…each participant processing the occasion in their own unique way. Graduation and commencement, (often used interchangeably) in truth speak to two different ideas…one an ending and the other a beginning. And I can’t think of a better way to mark the importance of that moment than by fully taking in the present.